The mortality from ischemic heart disease has decreased in recent years. The better understanding of risk factors associated with development of coronary artery disease (CAD) has significantly contributed to this decline. Preventive measures such as aggressive therapy of arterial hypertension, diabetes mellitus, and lipid disorders and by campaigning against the smoking are important components of this medical success. Furthermore, improvements in medical and interventional therapy have reduced the complications associated with acute myocardial infarction as well as revascularization. Interventional cardiology is a branch of cardiology and Andreas Gruentzig is considered the father of interventional cardiology after the development of angioplasty by interventional radiologist Dr Charles Dotter. As we know, interventional procedures have been complicated by restenosis due to the formation of endothelial tissue overgrowth at the lesion site. Restenosis is the body’s response to the injury of the vessel wall from angioplasty and to stent as a foreign body. As opposed to bare metal stent, drug eluting stents are covered with a medicine that is slowly dispersed with the goal of suppressing the restenosis reaction. One of the newest innovations in coronary stents is the development of a dissolving stent. Abbott laboratory has used a dissolvable material, polilactic acid that will completely absorb within two years of being implanted. Other key changes happened along the way. Perhaps the most important changes were a modification in mindset so that physicians demonstrated that they could successfully work less invasively within the vascular three. This changes leads to the development of invasive electrophysiologic procedures, such as mapping and ablation, percutaneous application of technology to treat valvular heart disease, and application of percutaneous technologies to treat peripheral arterial disease, and now cerebrovascular disease. Percutaneous methods initially introduced by interventional cardiologists should become the treatment of choice for a multiplicity of cardiovascular conditions. But we also examined in this book a periprocedural complication of coronary angiography, and coronary intervention. 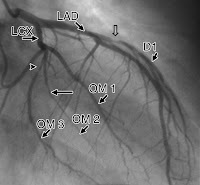 That includes related to cardiac catheterization and diagnostic coronary angiography, and those that occur as a consequence of the specific equipment. However, improvements in devices, the use of stents, and aggressive antiplatelet therapy have significantly reduced the incident of major periprocedural complications, and as an example, the need of emergent coronary artery bypass surgery decreased from 1.5 % in early 90, to 0.14% after 2000 year. This book should prove to be useful reference for cardiologists, radiologists, nuclear medicine physicians, anesthesiologists, cardiac surgeons, internists and basis scientists, their trainees and medical students who have an interest in this field either from the technical aspects or from clinical viewpoint.